For the village in County Sligo, see Bellaghy, County Sligo. 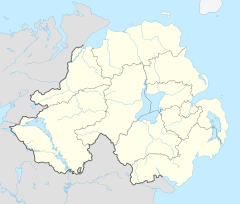 Bellaghy (from Irish: Baile Eachaidh, meaning "Eachaidh's Town") is a village in County Londonderry, Northern Ireland. It lies north west of Lough Neagh and about 5 miles north east of Magherafelt. In the centre of the village (known locally as The Diamond) three main roads lead to Magherafelt, Portglenone and Toome. It had a population of 1,063 people in the 2001 Census and is situated within Mid-Ulster District. It is known as the birthplace and childhood home of poet Seamus Heaney (1939-2013), who won the Nobel Prize for Literature. In October 2016 a new arts centre known as the Seamus Heaney HomePlace was opened. The $5.2 million building was constructed on the site of a former police station of the Royal Ulster Constabulary. There had long been Gaelic settlements in this area. Archaeological evidence has been found in the village of a Gaelic ringfort. In the early 17th century, Bellaghy became one of many towns planned, built and settled under the authority of the Vintners Company of London, as part of the English Plantation of Ulster. In 1622, according to a manuscript of a Captain Thomas Ash, Bellaghy consisted of a church, a castle, a corn mill and twelve houses. During the Plantation, English colonials built a fortified house in the village. It had surrounding walls and two circular towers at opposite corners. This is the best-restored example of a fortified house to be found anywhere in Northern Ireland. Recent excavations have revealed that the fortified house was built on the site of a former Gaelic ringfort. During the 1641 rebellion the house was attacked by local United Irishmen, but it remained intact. Many other houses in the village were burnt to the ground. Locally it was always referred to as "The Castle" and is located on Castle Street. The refurbished house was opened to the public in 1996 as "Bellaghy Bawn" although that name was not used in the locality previously. It is operated as a museum featuring exhibitions on local natural history, the history of the Ulster Plantation, and the poetry of Nobel Laureate Seamus Heaney. Heaney was born in the Bellaghy area on his family's farm and lived there for most of his childhood. He later lived in Dublin but is buried in the graveyard of St Mary's Catholic Church, Bellaghy. The village has been the centre of a rural community dominated by farming. Seamus Heaney, who became a Nobel Prize-winning poet, was born as the eldest of nine children at Mossbawn, his family's farm. A new arts centre, dedicated to him and known as the Seamus Heaney HomePlace, opened here. The $5.2 million building was financed by the Mid-Ulster District Council. It was constructed on the site of a former police station of the Royal Ulster Constabulary. The tensions of The Troubles made the redevelopment of the site a necessary part of the reconciliation process. The centre will feature talks, poetry readings, and performances. It has exhibits of photographs, texts, and poems to show the influence of place on his language. Two Bellaghy natives, Francis Hughes and his cousin Thomas McElwee, died participating in the 1981 Irish hunger strike during the Troubles. They were protesting at the treatment by the British and supporting political change in Northern Ireland. Other republicans include former Irish National Liberation Army leader Dominic McGlinchey, his wife Mary and his son Declan who died of a heart attack. Wikimedia Commons has media related to Bellaghy. ^ "Bellaghy, County Derry". www.placenamesni.org. Place Names NI. Retrieved 26 November 2018. ^ Bellaghy Placenames Database of Ireland. Retrieved: 2013-09-01.